Position the 2?E piston air bleed and large slot toward the top of the case. DT-47796 seal protector prevents the piston seal lip from damage during installation. Apply a thin coat of ATF to the I.D. of the DT-47796 seal protector to ease installation of the piston. Regulate the air pressure to 276 kPa (40 psi) maximum. High pressure could cause the piston to over travel and damage the piston seals. 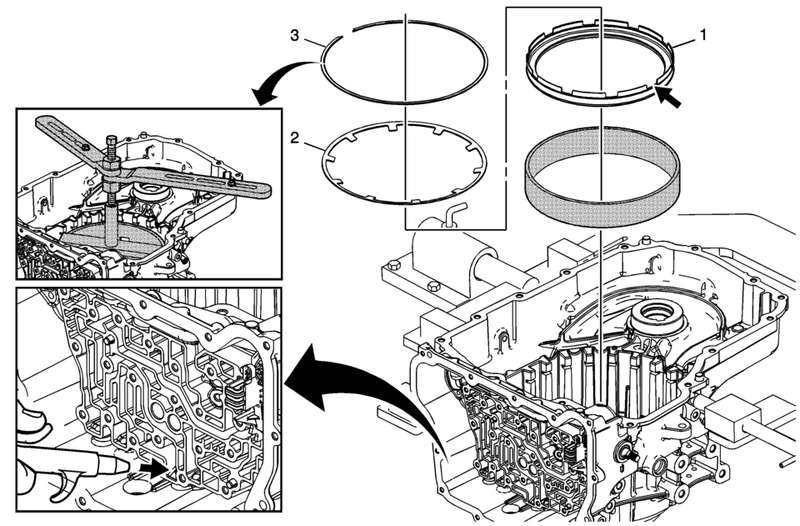 Place the retainer on the 2-6 clutch spring and align the retainer opening with the largest gap in the case splines toward the bottom of the case. The retainer opening should be supported by a spline tooth of the case. Apply shop air to the clutch fluid feed hole in the case to verify proper piston operation.